Racked to a carboy 2017-07-16. Fingers crossed! Just seems wrong to have empty carboys sitting around. Brew time! 2 quarts Clover honey. 6.5 or 7 lbs? Headed to 145° F then cooled slow-ish… didn’t feel like buying ice this time. Set the pot in cold water in the sink and changed it a couple times. Transferred to a primary fermentation bucket. 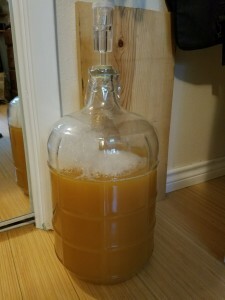 For secondary fermentation, I’m thinking of adding more mango. Chunks? Puree? I need to read about this. 2017-07-04: I was impatient last night and pitched my yeast before I proofed the starter. Also the must was warmer than the pros say it should be… about 70° F. Bah. Anyhoo, this AM it was bubbling away so it looks like it’s all good. I swirled it a bunch to oxygenate and de-gas so the yeast will multiply really well before switching to anaerobic mode. 2017-07-04: Later today our air conditioning broke down and was out for almost 2 days so the batch was subjected to 90° F temperatures. Not good! The primary fermentation was still in full swing, bubbling away during and after we got things cooled back down to 75° F. I’m hoping this didn’t stress the yeast and make it produce nasty flavors. 2017-07-09: Racked the batch into a clean bucket. Didn’t keep the yeast this time b/c of the heat ordeal it went through. I juiced 4 mangos and added it to the batch for secondary fermentation. The “juice” is more like thick pulp… mangoes are weird. I punched it down over the next few days but bubble activity ceased after only 2 days. Either the mangos didn’t add much sugar to keep the yeast busy or it was weakened by the heat up last week. I’ll rack it again next weekend and put it in glass to condition it for a month or so. 2017-07-16: Racked it. Cloudy as all get out. Just hoping the A/C failure didn’t ruin it. 2017-08-06: Racked it and tasted it… it has subtle mango notes but also something off… maybe yeast? Anyhoo, I’m going to add some gelatin to clarify it then rack it to bottles for a few weeks of conditioning. 2017-08-14: I never did add the gelatin. It’s starting to clear but still pretty cloudy.. ah! I didn’t add pectin enzyme when I added mango for the 2nd ferment. Not sure if that is common practice or not. I put it in the wine fridge to cold shock the yeast… get to flocculatin’ you critters! If that works I’ll go to bottles.